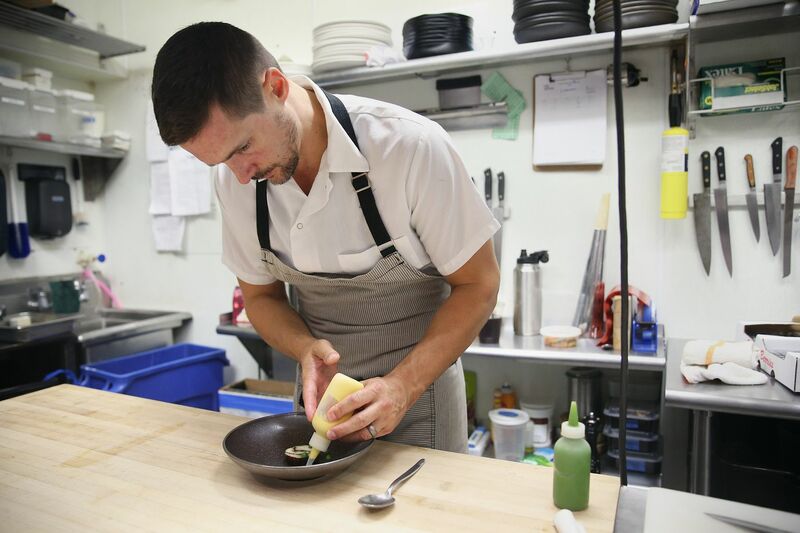 Chef-owner Nicholas Elmi plates the striped bass torchon at Laurel in Philadelphia's East Passyunk neighborhood on Thursday, Aug. 16, 2018. Saying he feared that the Laurel dining experience was becoming "inaccessible," chef Nicholas Elmi has changed the pricing structure at the critically acclaimed French-American restaurant on East Passyunk Avenue. Effective immediately, Laurel offers two tasting menus: a six-course version for $85 and — "for those who want to have a bit more fun," as he told me — a nine-course "grand tasting" for $125. Laurel previously offered only a seven-course experience for $115. Fixed-price dégustation menus, which are set by the kitchen and offer few substitutions, allow chefs to show off in each of the small dishes. "We don't ever want to price ourselves out of the market," Elmi said, acknowledging that the restaurant is coming off a "rough summer." Commodity prices, meanwhile, are rising. Fresh off Elmi's Top Chef win, the snug restaurant opened in November 2013 as a BYOB with a la carte dining and the option of tasting menu during the week, and the tasting menu only on Friday and Saturday. In May 2015, Elmi changed course, offering only a $85, seven-course tasting menu. In July 2016, Elmi opened In the Valley, a bar, next door. The liquor license allowed wine pairings at Laurel. Effective immediately, ITV is open seven nights a week. Elmi also is chef-partner at Royal Boucherie in Old City.